If a word can define a company, Sea-Doo would choose Passion. 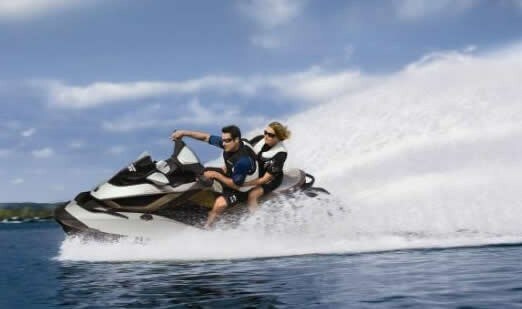 It was a passion for an idea that Sea-Doo's parent company, Bombardier Recreational Products, got its start in the 1930's. It was J.A Bombardier's passion to create a vehicle that could travel easily on snow that would not only spawn some of the most exciting recreational vehicles in history, but would revolutionize an entire industry. To some it would almost seem strange that the same company that specialized in making vehicles that travel on ice and snow could make one of the most exhilarating vehicles on the water, but it's true. And it was in 1968 that the first Sea-Doo was sold and made its appearance on the water. Styled in all yellow with black accents and seats, the first Sea Doo looked much like its snow cousin, but it wasn't until 1988 that Sea-Doo really made a splash with a relaunch and changed the way people thought about having fun on the water. Whether you buy a new Sea Doo or find a used Sea Doo for sale, not much has changed since. It was with that passionate spirit that is in everything the company does that lead to the most revolutionary invention in PWC technology: brakes on the water. In 2009 Sea-Doo launched the iControl system, including the iBR system, or, Intellegent Braking and reverse system on their top of the line luxury GTX models and their sports RXT line. Using the latest in drive by wire technology, they were able to control the reverse gate with a lever on the handlebar, similar to the brake lever on your snowmobile or ATV. When depressed, the system shifts the Sea-Doo into neutral, cuts the power, and shifts the unit into reverse, and reapplies the throttle... essentially, brakes. The allows the machine to stop up to 100 feet sooner than your traditional PWC and even lead to the US Coast Guard honours in their devotion to safety on the water. Sea-Doo is not a one trick pony though. Their sport boats are industry leaders as well. From the Speedster to the Challenger, their sport boats lead the way in performance and design and as used sportboats are popular sellers. This can only come from a company whose motivation is rooted in passion for what they do. 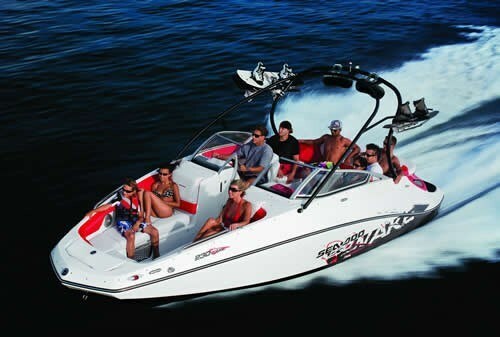 For 2010 Sea-Doo's PWC line up includes RXT, RXP, GTI, WAKE, and GTX; and Sea-Doo Sport Boats includes Challenger, Islandia, WAKE, and Speedster.